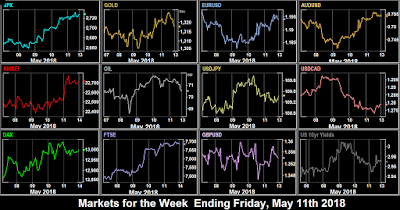 Comments from President Trump and TreasSec Mnuchin saying “we’re putting the China trade war on hold boosted equity markets which markets which all gapped up substantially from Friday’s close, with DJIA pushing through 25,000, and making a two-month closing high. 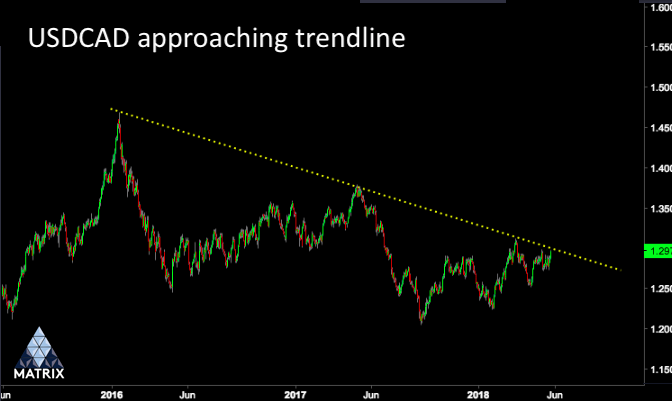 The Italian MIB was, however 1.5% down, for the political reasons we mentioned last week, as Italian 10-year yields rose 15bp to hit a 14-month high. 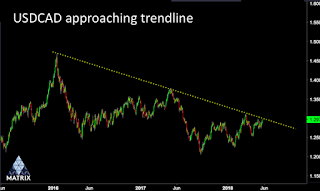 DXY briefly hit a new 2018 high, before pulling back to end 0.1% down, due to slight advances in all currencies except GBP, which continued its downtrend from last week. Gold, Oil and US 10-year bond prices (inverse to yields) were up in line with the weaker dollar. 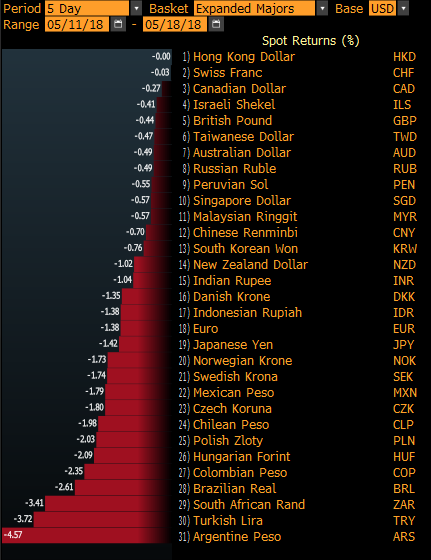 Also down was the Turkish lira, making a new all-time low. The momentum continued at first on Tuesday, with DAX rising sharply as it had been closed the day before. 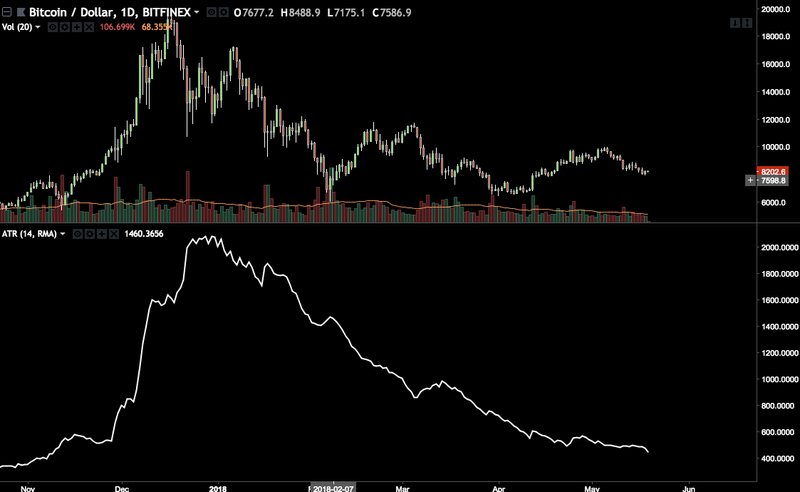 Other indices showed a similar trend. 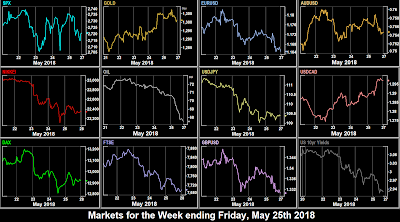 However, the 2740 resistance area (from the May 14th high) proved too much of a barrier, and markets retreated hard in the late US session, after Europe had closed. 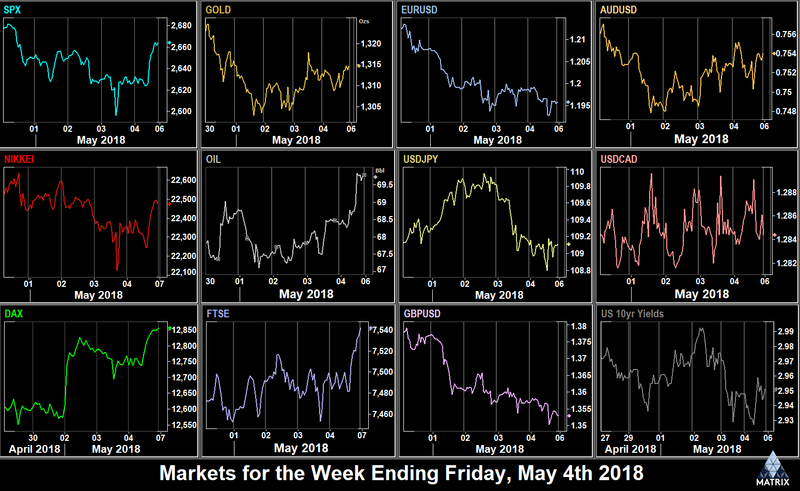 The currency situation was much calmer with DXY again pulling back 0.1%, a combination of slight increases in JPY and GBP, and slight pullbacks in CAD and EUR. AUD was also down. 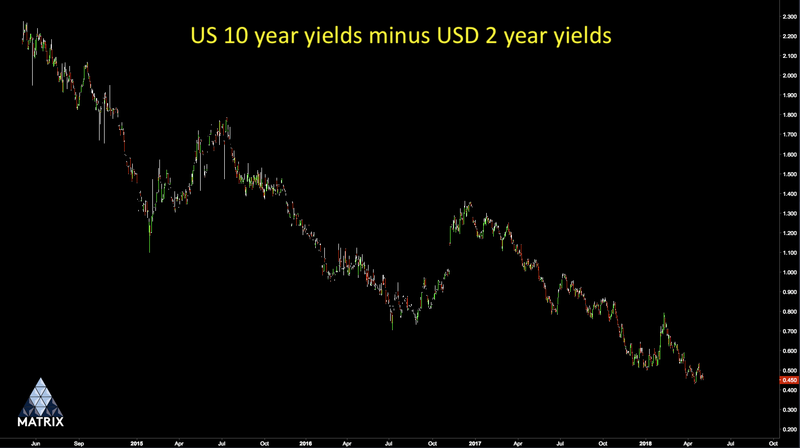 Gold and bond yields were flat. After making a new three-year intraday high, Oil pulled back on talk of OPEC easing production limits. TRY made another ATL. DAX gave up 0.66% in the first 20 minutes and fell 1.17% today on Italian and Turkish worries (despite progress, after an emergency rise in TRL interest rates added a huge 7.25% to the currency), and NKY (after a very strong yen Asian session) and FTSE were also sharply down, all following SPX the day before. However, the relatively dovish FOMC remarks gave a lift in the US afternoon, and SPX actually finished slightly up. The same remarks only put slight dent in a good recovery day for USD. DXY added 0.4%, and EUR and GBP were well down, the former on Italy worries, and the latter after the inflation miss at 08:30. Oil fell again on OPEC issues. Counterintuitively Gold was a little up, and bond yields were down, so together with JPY the risk-off signs were there, even with SPX up. A warning sign for Thursday perhaps? President Trump called off the North Korea summit today, and threatened to impose car import tariffs. Also the falling price of Oil, down again today, had a knock-on effect on energy stocks. All this pushed SPX down sharply by 1% at the open, although it quickly recovered to close only 0.2% down, as defensive stocks rallied. A similar pattern was seen across the other world indices. The big move today was Oil, after OPEC and Russia indicated that output would increase. It dropped 4.6% to touch its 50-day moving average, the worst single-day fall since June 7, 2017. 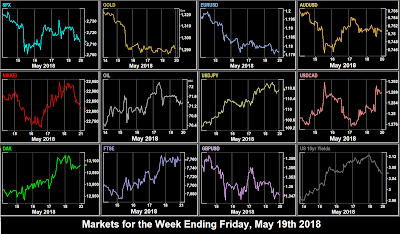 The energy heavy SPX and FTSE fell in line, whereas the DAX, which contains oil consumers (cars, tyres) but not producers put on modest gains, as did the oil-free NDX. NKY also fell, probably more on a strengthening yen. 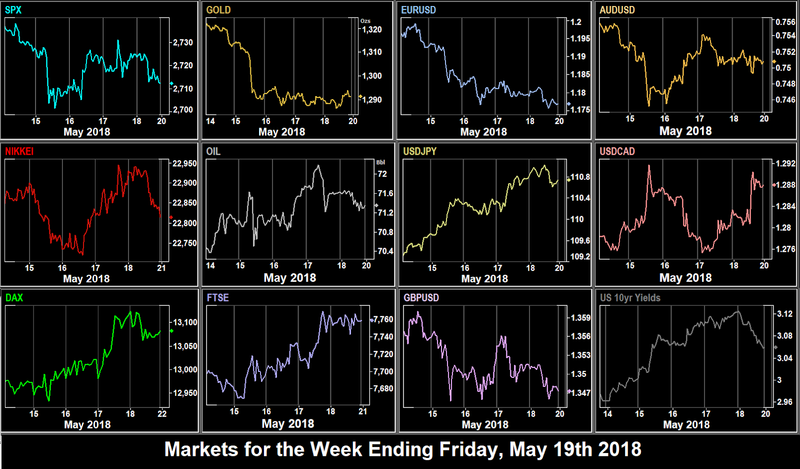 It was a strong day for the dollar, with DXY up 0.48%, and all currencies (and Gold) receding. 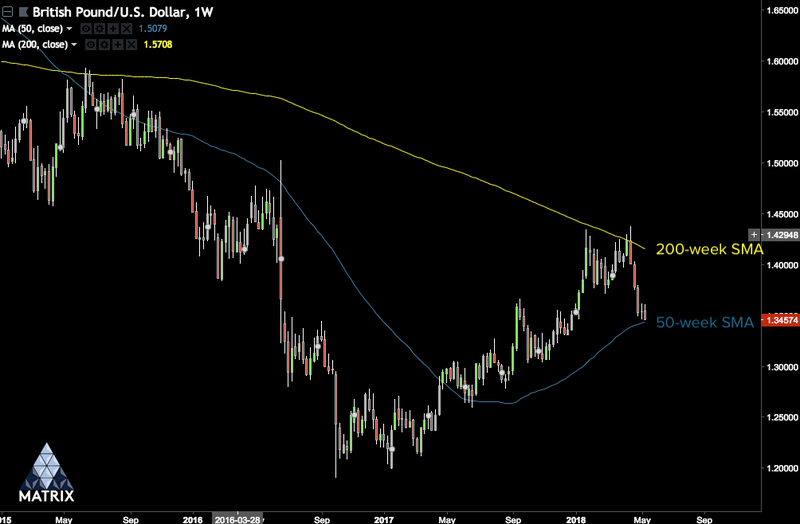 EURUSD hit a six-month low on further Italian, and now Spanish (Catalonia and corruption) worries. 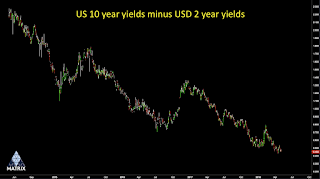 Both Spanish and Italian 10-year yields rose sharply, whereas UK, US and Germany yields fell. The MIB and IBEX also fell 1.5% and 1.8% respectively. 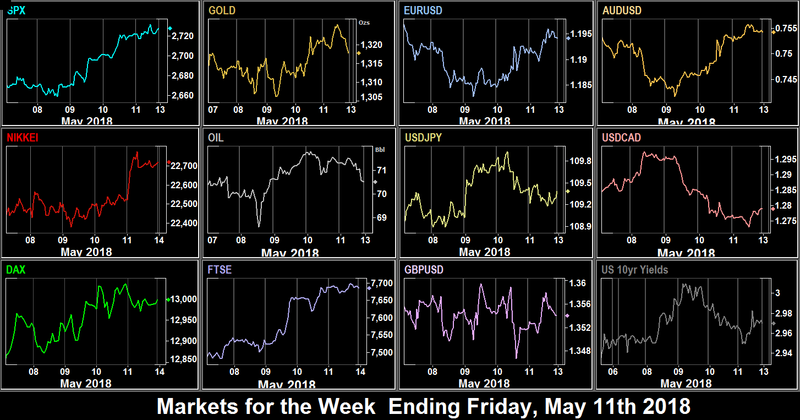 A very mixed week for USD, with strong JPY appreciation, but GBP fading after the CPI miss. Selling GBPJPY would have yielded 2.46%. Non-US Indices fells, the strongest being NKY which reacted to the stronger yen. Shorting this was the best index trade. Cryptos took another tumble this week, giving up a month’s gains. There has been a little recovery at the time of writing. Today is Memorial Day in the US and Spring Bank Holiday in the UK. Both markets are closed, although Europe and Asia are open as normal. There are no major news releases. Fed Bullard (dove, non-voter) speaks in Tokyo at 04:40 shortly after the Japanese jobs data. Five ECB speakers today: Villeroy (dovish, voter) at 07:45, Visco (dove, non-voter) at 08:30, Mersch (hawkish, voter) at 09:30, Lautenschläger (hawkish, voter) at 15:30, and Coeuré (hawkish, voter) at 16:00. News is again light in Europe and the US, although expect additional American volatility because of the Monday holiday. The main event today (and second most important of the week) is the Canadian rate decision. No change is expected, while NAFTA rumbles on. 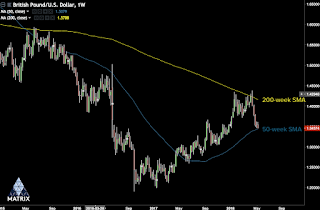 It should be noted that USDCAD is approaching long-term trend resistance. Also important are the simultaneous US GDP and PCE (inflation proxy) prints. Spanish inflation is also published today, not normally an important release, but heightened by the recent strong decline in IBEX (see above). Today is also ADP, the ’sneak preview’ for NFP. The estimate is 190k, slightly ahead of the NFP estimate of 185k. Of course the figures were 40k apart last month. In speakers, as well as Kuroda (listed below) we have RBNZ Governor Orr at 01:10. 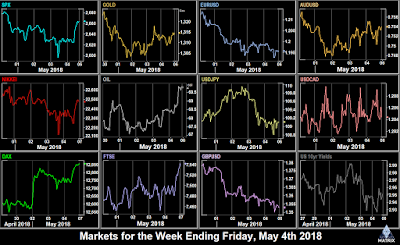 The final day of May is likely to see some portfolio rebalancing into the summer. Today is a ‘hard deadline’ for compromise on NAFTA. Fed Brainard (centrist, was a dove, voter) speaks at 17:00 (time approx), also we have Bullard, still in Tokyo at 10:00, and Bostic (centrist, voter) at 16:30. Canadian GDP is mostly important for its potential to reverse any big moves following Wednesday’s rate decision, as there will be no simultaneous US and Canada jobs report this month. 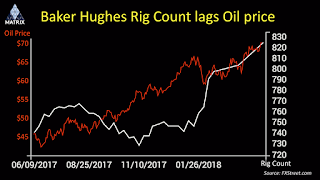 The EIA Oil stock print is a day late due to Monday’s holiday, and may have a noticeable effect given recent volatility in Oil. We have the earliest possible NFP date today, without the Canadian print which is the following Friday. Also, importantly, the Canadian, Mexican and EU tariff exemptions expire today in the absence of any new agreement. Amongst a raft of Markit PMIs today, the one to watch is the UK, as some good news is needed after the CPI miss last week for any possible rate hike in June. 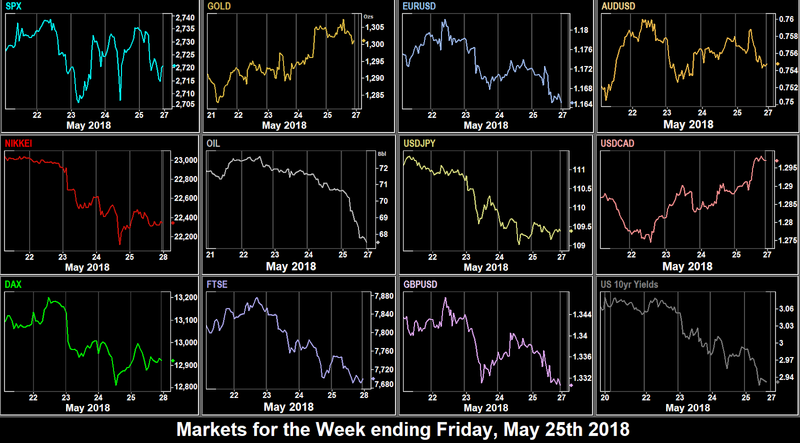 Today was the day the currency movements materially caught up with equities. It was another good day for USD, up across the board, and notably so against JPY and GBP. SPX was flat on the day, but NKY, DAX and FTSE soared, the latter making an intraday (7799) and closing (7783) all-time high. 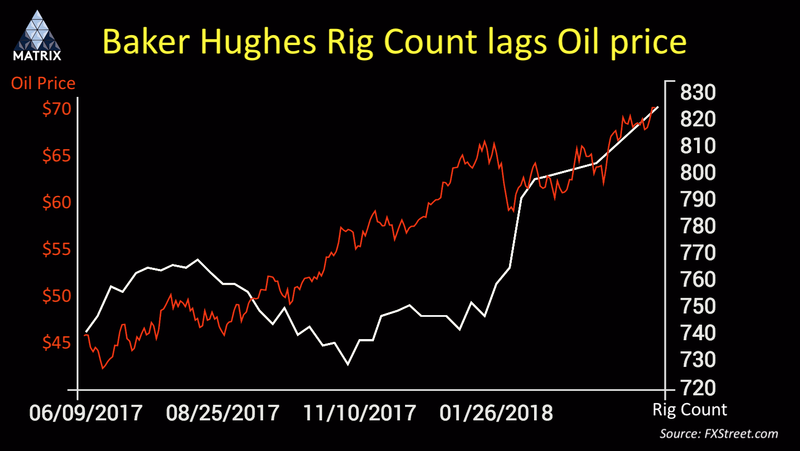 This was aided of course by the falling pound, and the surge in the price of Oil (Oil & Gas is 16.4% of FTSE, higher than any other except TSX (19.4%)). Even MIB recovered slightly. Oil itself was flat today, but not before touching an intraday of $72.28. 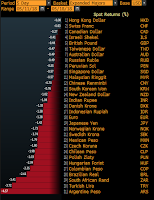 This Bloomberg table shows the USD state of play for the week on Thursday evening. 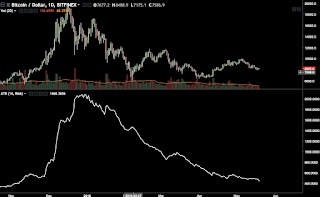 After last week’s fall, cryptocurrencies were virtually flat this week, as volatility continues to reduce in the sector, as you can see in this chart. Today is the biggest day of the week. At 08:30 we have UK CPI. This is the first, and most important of the three key UK releases this week which will influence the BoE’s next rate decision on June 21st. Then we have the all-important FOMC minutes later in the day. As ever, forward guidance is the key. SecState Pompeo appears before the House Foreign Affairs Committee. South Africa inflation is reported.